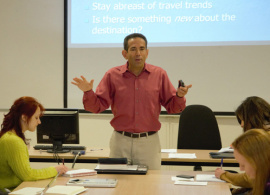 Broad teaching expertise, rich journalistic experience, love for writing and traveling and a Fulbright Scholar grant: this is how visiting professor Dan Fellner ended up at AUBG for spring semester of 2015. During the time spent at the university, Fellner was able to transfer his passion for travel writing together with his knowledge of successful freelance practices to the students. The result: six AUBG undergraduates published in various media across Europe. In addition to being a faculty associate in the School of Letters and Sciences at Arizona State University's Polytechnic campus, having previous experience in TV news in four different cities, and working in corporate public relations for a decade, Fellner has been doing freelance travel writing for more than 15 years. AUBG is not the first university in Eastern Europe that Fellner visits. He had taught at six different educational institutions in the region, has received two Fulbright Senior Specialist grants to teach at universities in Lithuania and Latvia, and has taught a one-week intensive course in communications four times at the Fulbright International Summer Institute in Bulgaria. Anna Bashuk, AUBG junior and one of the students from the Travel Writing class, got two of her class assignments published. Bulgaria’s biggest English language news agency, Novinite.com, published her stories on a Blagoevgrad art exhibit and the Metropolitan Cathedral located in Iasi, Romania. “The travel writing class was a fun experience that showed me how difficult but how rewarding it is to be a travel journalist, and it inspired me to pursue getting my stories published,” she said. AUBG senior Konstantina Bandutova wrote and translated her story on the Bulgarian resort town Bansko for www.bansko.net. Among the other published students are Ekaterine Tchelidze, who wrote an article on Bulgaria’s Bachkovo monastery for Georgia Today, and Inessa Lotonina who told the legend of Bulgarian visionary Vanga in an article for novinite.com. AUBG student Lyuba Popova told a story on the Bulgarian picturesque winter resort Bezbog that was published in Whiteroom, a Bulgarian snowboard magazine, and senior JMCer Veselina Apostolova had her article on Budapest’s seventh district published in Budapest Times. 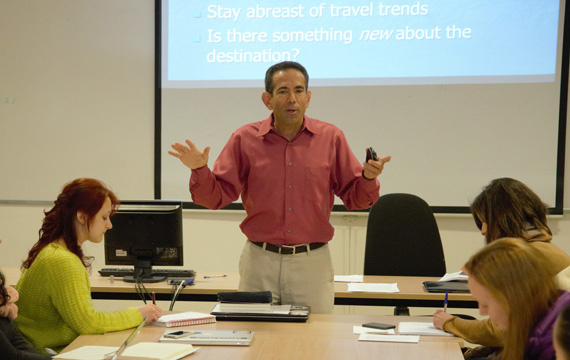 In addition to Travel Writing, Fellner also taught a course at AUBG called Intercultural Communications. “Having students from so many different countries in that class made it a wonderful environment in which to discuss issues related to cultural differences,” Fellner said. While busy teaching two classes at AUBG, Fellner found the time to do travel writing himself. “It’s important for me to stay active and up-to-date on the subjects I teach,” he said. Fellner traveled to Thessaloniki, Greece, to write a story on the Mediterranean city that will be published in a U.S. magazine this summer. During spring break, he went to Dubai and wrote a travel story about the world’s tallest building for the Arizona Republic, one of USA’s largest newspapers.